Senior aerospace engineer Anika Ahmed’s struggles as an international STEM student are motivating her to success. She is a leader of many organizations on campus. Ahmed is currently interning at Aether Vision, an UAV-manufacturing company, and will be focusing on her senior design project in the fall. What brought me 9,000 miles away from home is the sheer desire to be in the aerospace industry and probably rule it at some point! Back in Bangladesh, it seemed like a huge dream, but now that I’m a year away from graduating with an aerospace degree from Florida Tech, it feels surreal. That’s right, I’m an aerospace engineer. Actually, two-thirds but whatever. And my chin lifts up every time I say it. Anika won the in the open-topic category for her paper on Space Launch System and as the conference chair for AIAA at Florida Tech at the AIAA Region II Conference. So, it will not come as a surprise to learn that my involvements on campus are mostly aerospace related. 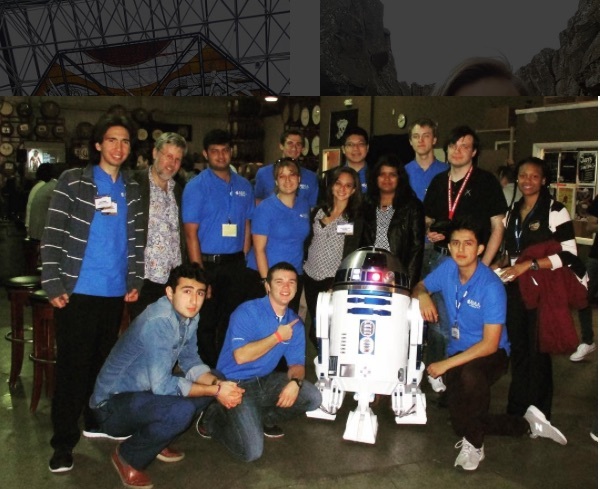 I’m the President of IEEE Aerospace and Electrons System Society, Conference Chair for American Institute of Aeronautics and Astronautics; Student Ambassador in the Admissions Office; Vice President of Sigma Gamma Tau Aerospace Honor Society; member of Phi Eta Sigma Honor Society; intern at Aether Vision, which is an UAV-manufacturing company; and member of Women in Aviation among other things but I feel these should suffice as an intro. When I’m not consumed with engineering, I spend the rest of my time in the Marvel and DC universe, as a Potterhead, watching American television (Valar Morghulis), and travelling however much I can afford and spare in my college budget. Oh, did I mention I’m a sucker for psychological and suspense thrillers? That, too. What inspired you to pursue your major? I always had a liking for aviation in general, so it was just a matter of time before I settled for aerospace engineering as a profession. But, that wasn’t the major force that propelled me for this major only. Growing up in a family that never valued and supported women to pursue higher education or have a profession or become fully independent had instilled in me a boldness that has brought me here in U.S. despite many resistances to get a degree, have a career, and set an example back home. I don’t think I’ve faced any problem for being a woman in STEM, but as an international student, I’ve had to struggle a lot in terms of work clearances, limited employment opportunities both on and off campus, and having to start over everything in a completely new place. That leaves me with very limited options to explore and choose from unlike my local counterparts. But then again there is no such thing as smooth sailing in life so I’ve to tackle it and emerge from it as successfully as I can. 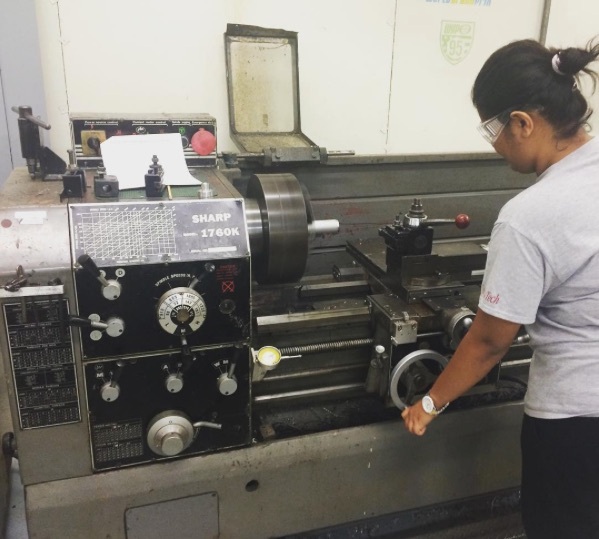 Anika working at the lathe machine to secure certification for her senior design next semester. So many! But I feel I’ve had a good run so far despite all the hurdles and mistakes. In fact, my mistakes and failures have made me a better and wiser person. So, maybe I’ll just tell my younger self that (a) nothing lasts forever – acne scars, mistake in the final paper, dispute with a loved one, anger, and (b) it never matters what people think (this is a real deal breaker). At times you’ll feel that you don’t belong here and you’re not smart enough for this but try not to succumb to it. I still wake up feeling pretty dumb most days. In today’s world, promotion is key to anything and everything. There are tons of STEM programs, organizations like Society of Women Engineers, mentor services, etc. but not enough promotions. If they use TV ads and target social media to advertise more of these programs and less of Prada and Gucci, then we can reach more younger girls in a faster rate.